The August challenge over at the group blog Then Dig was to produce a post with suggestions for good archaeology reads. I wrote up a short piece on anthropology books for kids, which is cross-posted there and below. But if you read through to the bottom of this post, I've also included some suggestions for the budding classicists. After reading a few of Matt Thompson's "Illustrated Man" posts over at Savage Minds, I decided to search for children's books that go beyond the ubiquitous kiddie-adventure-with-moralistic-underpinnings storylines. Now, those books aren't all bad. My 2-year-old daughter and I both really like the Adventures of Patrick Brown book series, which is lushly illustrated in an almost graphic novel style and which employs a good level of vocabulary that doesn't talk down to kids whose language skills are increasing at an astounding pace. But my ultimate goal was to find books related to my life-long interests - archaeology and biological anthropology - that I could share with my daughter. More importantly, I wanted to find books that won't make me pull my hair out when I inevitably have to read them over and over and over again. I discovered, though, that it's surprisingly difficult to find books geared towards the preschooler set that aren't board books with too little dialogue (half of the words in Fifteen Animals are "Bob") or lightweight stories about everyday activities that reinforce old gender norms (I'm looking at you, Berenstain Bears). Most of the books that interested me and that tried to communicate a small part of what I do for a living seemed to be written for kids in late elementary school. Fortunately, I managed to stumble upon a couple books that captivate the attention of a squirmy toddler and her academically-inclined mother. Amazon.com lists over 1,100 results for children's books about archaeology. It's pretty daunting, and I ended up getting some duds. The best one by far - which I highly recommend - is Archaeologists Dig for Clues by Kate Duke. 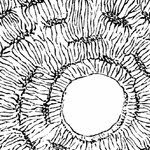 The format has some graphic novel qualities to it, with little dialogue bubbles in addition to the text and side-bar explanations, which cover everything from water screening to ceramic typology. The characters are quite diverse in their gender, age, and race. Although the story - a day in the life of a field archaeologist - condenses basically an entire field and lab season into one day, the portrayal of the field archaeologist, the explanations about the tasks she undertakes, and the demonstration of what specialists do at the lab are all quite good. A recent New York Times Sunday book review profiled two works about the life of Jane Goodall: The Watcher and Me, Jane. One of my friends sent a copy of each for my daughter's birthday. Jeanette Winter's The Watcher is definitely the better book - with more words and better vocabulary, the story introduces children to some basic concepts in primatology and anthropology. Winter's illustrations can be used to get children involved in watching too: Jane doesn't immediately see the chimps, who are hiding in the trees, and it's fun to ask my daughter to point them out and count them. This book also deals with events like Goodall's bout of malaria and the progressive endangerment of chimpanzees because of poaching and deforestation, all while remaining approachable by kids. One of the things I dislike about Patrick McDonnell's Me, Jane (other than the title, which irrationally annoys me) is that he jumps from little Jane dreaming about chimps to Goodall in the field, skipping the trouble, hardships, and work she had to put in to get from interested kid to adult researcher. Anthropology isn't as simple as digging a hole in your backyard or looking at an ape through a zoo window for a few minutes, and The Watcher manages to get this point across quite well. It's a surprisingly thorough (for a kids' book) story of Jane Goodall's life written in a way that challenges younger readers but at the same time doesn't talk down to them. I definitely recommend The Watcher, but I'd give Me, Jane a pass. Special bonus for those of you who read my blog for the classical side of my research: I also tried to find books appropriate for toddlers that introduce them to the wonders of ancient Greece and Rome. The best I could come up with were two books by Rosemary Wells. She writes the Max & Ruby series, which my daughter absolutely loves. 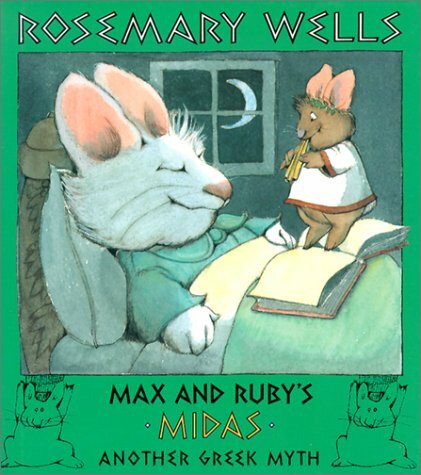 Max and Ruby's Midas is, of course, a modern retelling of the Midas myth. Max overly indulges in cupcakes, so Ruby reads him the story of Midas, who lived in ancient Greece and one day found that he could turn everything he saw into sweets... including his parents and his big sister Athena. Midas simply wishes away his power in the story, and everything is restored. Max learns nothing and sneaks a cupcake at the end. 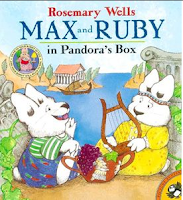 And then there's Max and Ruby in Pandora's Box, a retelling of the Pandora myth. 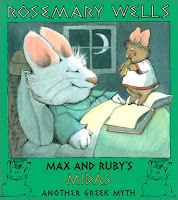 Max keeps sneaking into Ruby's room and touching her things, so she reads him the story of Pandora, a little girl whose mother cautioned her not to go into her jewelry box. 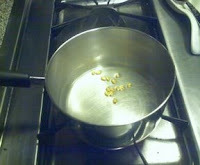 Pandora opens the box, and hundreds of bugs fly out. She's about to close the lid when a spider pops her head out and says that she's Pandora's only hope. Pandora's mother comes home, checks on the box, and finds all her bug-themed jewelry still there. The first part of the myth is reasonably close to the original, but the ending (as many modernized Greeks myths are) is too happy. Max, of course, appears to learn nothing from the story or from his sister. Perhaps I should also mention Lisl Weil's oddly illustrated (and hard to find) The Boy Who Flew Too Near the Sun. It's notable in that Icarus actually dies at the end, which just doesn't happen in children's books these days. Interestingly, Weil also wrote and illustrated a book called King Midas' Secret and Other Follies, which includes the myths of Midas, Narcissus, the Sphinx, and Daedalus and Icarus, but in this one Icarus doesn't die. If you're looking for children's books closer to the original Greek myths, Weil's books may be of interest. If you've found any other good kids' books on archaeology, biological anthropology, or the classics, let me know in the comments! I'm always looking for new titles for my voracious little (not-quite-)reader. Thanks for this post. As a service-learning project, my students are creating a preschool/kindergarten-level lesson on archaeology and regional prehistory for the local schools. These are some helpful resources! Is the "Archaeologists Dig for Clues" book something that could be read aloud to preschoolers without losing their attention? Hi, Palimpsest. Well, I read "Archaeologists Dig for Clues" to my 2-year-old, who seems interested in it. I think it would go over better with kids a few years older, but there are definite ways to make it interactive for the little ones (e.g., "Can you find the X?"). There is a lot going on in the illustrations, so it might not be the best book to read aloud to a class - individuals or small groups are probably best. I love this! I don't have kids, but I always thought that if I did, I would start indoctrinating them when they are very young so that they can grow up loving archaeology like I did! I actually saw a book in a store a few weeks back called Coming of Age (Rites of Passage) that was a book on different rites of passage in a different cultures that was for kids. It was by, I think, Mandy Ross. If anyone knows of the book, I'd love to know if it is any good. That was the first time I had actually seen a cultural anthropology book for kids! At least one that was not simply about, say, the culture of another country like China or France, or some other veritable travel book. I did not read it, but it seemed like a cool idea. Good to know that there are good books out there for kids to be introduced to anthro, archaeology and biological anthro. I have friends in college who have no idea what archaeology really is, and even more who have no idea what anthropology is at all!!! Thanks for the post! Oh man, my dirty little secret is that I loved Relic Hunter. So lame, but so entertaining. With all the hullabaloo over the last year about the place of science within the discipline, it's not really any wonder that the general public thinks that anthropology = talking to foreigners in a third-world country, but archaeology = using fancy tools to dig in the dirt and doing aDNA analysis. I take pains to emphasize the four-field origins of American anthropology to my students (something I didn't really learn about until grad school, oddly enough), showing them how anthropology is really about culture, biology, and language in the past and the present. But when I meet someone for the first time and they ask me what I do, I say I'm an archaeologist because that's generally a recognizable profession, and I don't have to explain why I study dead Romans yet call myself an anthropologist (and not a classicist, archaeologist, or, for some confused people, an Egyptologist). Since I am both an anthropology major and a biochemistry major, I tend to just tell people I am a biochem major(it's bad, I know). When I say I am an anthropology major I either get the people who have no idea what it is an scoff at it, or I get the people who have no idea what it is but think it is cool that I study dinosaurs. Still no clue why people think I study dinosaurs. Don't get me wrong, dinos are awesome, but I don't study them. The four field approach how it is taught at my school. Archaeology and paleoanthropology, with a brief section on early language development, are combined into one required(for anthro majors) intro anthro course and cultural anthro, again, with a short section on language, is another required intro course designed to introduce all four subfields. Unfortunately, it seems like the linguistics side gets the short stick. Both give a good overview of the four fields all together at the beginning, though, so either one introduces all four fields and then focuses on one or two. Just adding another note of appreciation for these great suggestions. 3)Is that the study of bugs? I always thought it was so curious that humans (especially in US) don't know the study of humans. My last week of college I met a man in his 60's that was the laundromat attendant. When I told him what I my degree was in, his knowledge on the subject flowed over and he recounted his life dreaming of being an anthropologist in every facet of the field. He instead became a Mexican Luchador. It reminded me that ours was a noble profession that inspires us to continually explore humanity and I feel a tighter bond with the people who actually know about it. It's kind of like a secret hand shake. Needless - this was a great list of suggestions and thanks for taking time to note your finds for the budding anthropologists out there.